The application process for scholarships for the Fall 2019 freshmen class is now open. The deadline to apply for this funding for the 2019-20 school year is 11:59:59 pm on December 10, 2018. 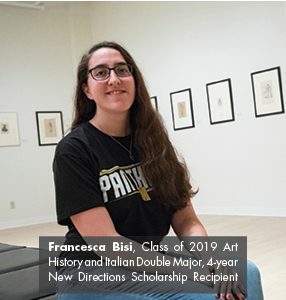 The New Directions program provides up to $3,500 for exceptional full-time freshmen enrolling in an undergraduate degree program within the College of Letters and Science (L&S) beginning in Fall 2019. If you continue to meet the grade point and credit load requirements, your scholarship can be renewed for three additional years – meaning you will receive support for all four years of your undergraduate education up to $14,000 total. You are strongly encouraged to apply if you have an unweighted high school GPA of 3.75 or higher AND an ACT score of 27 or higher (or equivalent score on the SAT). Recipients also will have a strong record of extracurricular activities and academic and personal achievement. Please emphasize your achievements both in and out of the classroom on your application. The Meadows Fund Scholarship is given to a full-time undergraduate who have been in the foster care system. Awards up to $2,500 are available and may be renewable depending on academic performance and available funds. This scholarship application is open to any major with demonstrated academic potential, as indicated by a GPA of 3.0 or above. The Weather Innovators scholarship program is funded by the Milwaukee Metropolitan Sewerage District, the Lake Express Ferry, and the Brewers Community Foundation. The program awards multiple scholarships to new, full-time freshmen who intend to major in Atmospheric Science. The students selected will have demonstrated great potential for academic success and must have a minimum high school GPA of 3.0 and a minimum ACT composite score of 24. The Weather Innovators Scholarship is for $2,500 per academic year and may be renewable for 3 subsequent years as long as the student continues to meet the scholarship criteria. The Brewers Community Foundation Weather Innovators Scholarship is for $1,250 per academic year and may be renewable for 1 subsequent year as long as the student continues to meet the scholarship criteria. Upload a copy of your high school transcript. If you have already sent your transcript as part of an application for admission to UWM, you DO NOT have to upload your transcript. Upload one letter of recommendation from a teacher or high school counselor who is familiar with your academic potential. A resume that demonstrates your achievements both inside and outside of the classroom; this could include employment, volunteer work, extracurricular activities, awards, and anything else you would like the scholarship committee to know about your accomplishments. The deadline to apply is 11:59:59 pm on December 10, 2018. Awards will be made around January 20, 2019. Please send any questions to Assistant Dean Deanna Alba, dsalba@uwm.edu, or call (414) 229-7711. Visit the program’s web site to apply. The application process for Fall 2019 is open, and the deadline is January 31, 2019. Questions can be directed to Associate Professor Clark Evans.